Iron County exists because those who lived here developed the resources necessary for survival in this desert climate. The three legacies passed down by early settlers and their descendants — agriculture, mining, and railroads — are represented here. Agriculture, symbolized by the hay derrick, became the foundation of the local community. When early mining operations ceased, Iron County residents turned to sheep and cattle to provide needed trade goods. Today, the region still has a vibrant and expanding agricultural lifestyle. Mining, represented by the ore shovel, is the industry that began it all, proving to be the initial motive for settlement. In 1923, the mines began producing ore by the tons and elevated Iron County to one of the richest counties in Utah for nearly 50 years. Recently, the mines have reopened and the tradition continues. our scenic wonders. Hollywood came to Utah, traveling by train, into Cedar City. The railroad literally brought the world into our backyard. 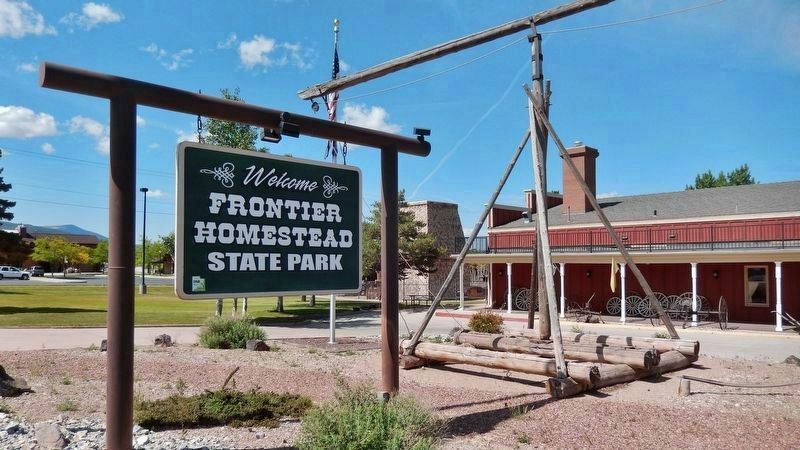 Frontier Homestead State Park invites you to explore, discover, and remember the legacies that transformed our community. They are a testament to our past and guideposts to our future. Location. 37° 41.317′ N, 113° 3.736′ W. Marker is in Cedar City, Utah, in Iron County. Marker is on North Main Street (Utah Route 130) south of Iron Mission Parkway (West 685 North), on the right when traveling south. Touch for map. 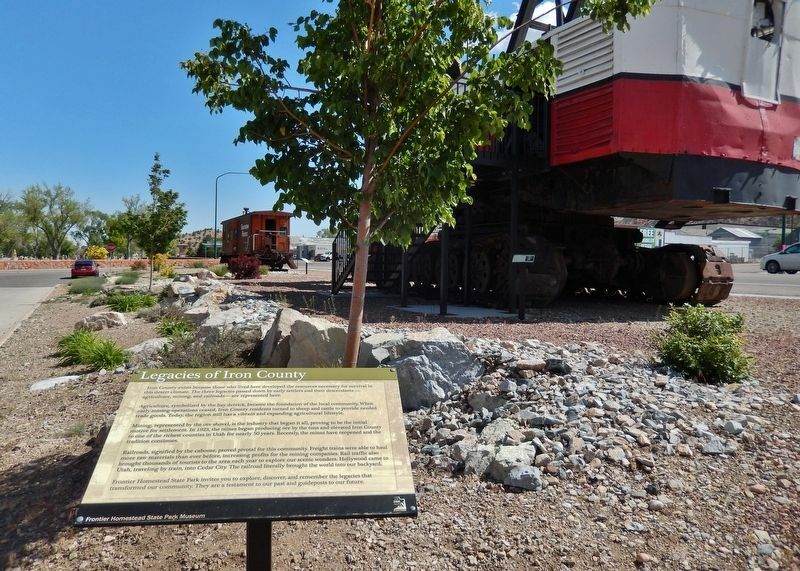 Marker is located within Frontier Homestead State Park, just south of the giant Ore Shovel exhibit, near the museum front entrance on North Main Street. Marker is at or near this postal address: 635 North Main Street, Cedar City UT 84721, United States of America. Touch for directions. (approx. 0.3 miles away); Cedar City Railroad Depot (approx. half a mile away); Escalante Trail (approx. half a mile away). Touch for a list and map of all markers in Cedar City. More. 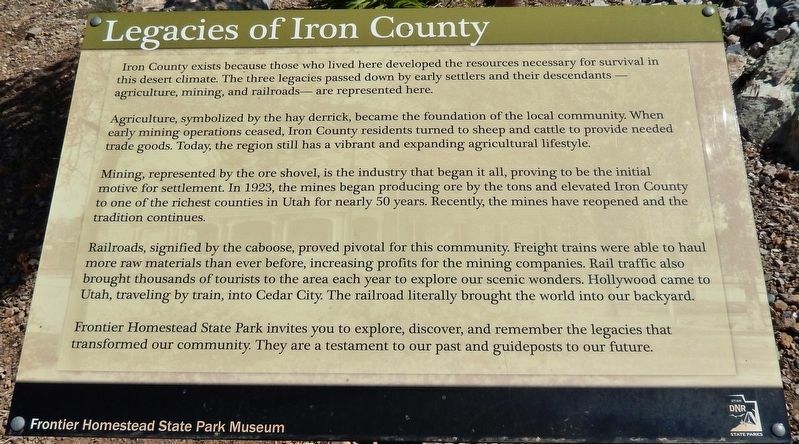 Search the internet for Legacies of Iron County. Credits. This page was last revised on March 6, 2019. This page originally submitted on March 4, 2019, by Cosmos Mariner of Cape Canaveral, Florida. This page has been viewed 30 times since then. Photos: 1, 2, 3. submitted on March 4, 2019, by Cosmos Mariner of Cape Canaveral, Florida. • Bill Pfingsten was the editor who published this page.